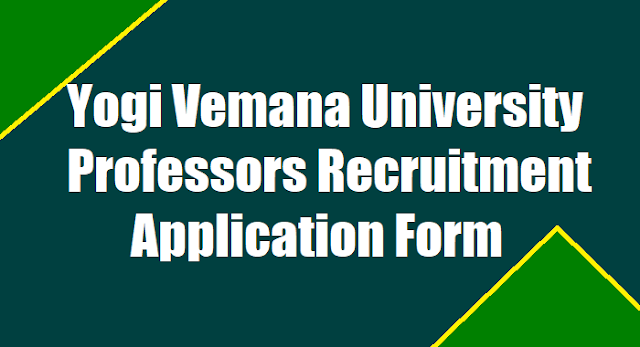 Yogi Vemana University - Backlog Associate/ Assistant Professors, Last date for YVU Professors recruitment 2018, YVU FACULTY POSITIONS Recruitment 2018, YVU Teaching Staff Recruitment 2018 - Yogi Vemana University, Kadapa invites applications for the post of Backlog Associate/ Assistant Professors and PROFESSORs in the following Departments of Yogi Vemana University College, Kadapa and YSR Engineering College, Proddatur. For the application format, Prospectus with eligibility criteria, experience, registration fee and other details, please visit the University website, www.yogivemanauniversity.ac.in. Filled in applications, along with Registration fee of paid by way of Crossed Demand Draft Drawn in favour of The Registrar, Yogi Vemana University, Kadapa payable at State Bank of India, YVU Branch, Kadapa (IFSC Code: SBIN0010109) and should reach the undersigned on or before 31.01.2018 by 05:00 p.m.
Online Applications are invited for the posts of ASSISTANT PROFESSOR in the following departments. For the Registration, Submission of Online Application with eligibility criteria, Research, Experience, Registration fee and other details, please visit the website http://www.sche.ap.gov.in/ASSTPROF/Masters/Home.aspx, go through linked with University website www.yogivemanauniversity.ac.in. Last date for submission of online application Phase I is 27.01.2018/ Phase II 29-01-2018. Filled in online application along with acknowledgement of Registration fee, should be downloaded and submit the same with all necessary documents to The Registrar, Yogi Vemana University, Kadapa-516003 on or before Phase I 31.01.2018 / Phase II 01-02-2018 by 05:00 PM. Roster Points for the following 21 (Assistant Professor) and two (Assistant Physical Directors) teaching posts (sanctioned by the government of Andhra Pradesh, Dept. of Higher Education (UE) vide G.O. MS. 28, dated 30.06.2017 under Phase I.
Roster Points for the following three teaching posts (Assistant Professor) sanctioned by the government of Andhra Pradesh, Dept. of Higher Education (UE) vide G.O. MS. 28, dated 30.06.2017 under Phase II. 3. Last date for receiving the printed online application (in two copies of particulars) along with all the necessary documents 31-01-2018.